Kombucha Wonder Drink promotes vitality and great health. Available in eight distinct flavours, it is made from excellent teas and healthy organic ingredients. An elderly woman in Russia shared this secret of the Kombucha culture to Steve Lee back in 1990. Ever since, he and his team of experts have manufactured this wondrous brew to benefit the health of people worldwide. Kombucha Wonder Drink make a modern version of an ancient drink: kombucha, a sparkling fermented tea from the Himalayas enjoyed for generations in Asia and Russia for its vitality-boosting cleansing and detoxifying effects. Founded by Steve Lee (of Stash and Tazo fame), the company is headquartered in Portland, Oregon. Kombucha Wonder Drink is an experience that is meant to be savored. Its distinctive taste and sparkling tingle hints that something magical is occuring, and from every sip a sense of vitality transpires. The origin of Kombucha dates back centuries. In the spring time, wise men would come down from high in the Himalayas to gather tea in the valley below. According to a method passed down from generation to generation, the tea was fermented to create a sparkling elixir said to promote health, longevity and offer mental clarity to anyone who drank it. 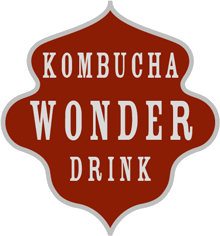 Kombucha Wonder Drink is made nowadays, in the exact way, with one advantage - each small batch goes through a process to eliminate alcohol and unwelcome bacteria. What remains is pure kombucha and the organically occurring acids that give it its energy!